Valentine's Day may still be a little over a week away but there was a lot of love in the air at the Stade de France on Saturday night as France rekindled their tempestuous romance with their fans thanks to a display that set the bar for this year's Six Nations. Booed off the field just a few months ago following their mauling at the hands of Australia, Les Bleus entered this year's Championship playing catch-up not only in terms of the affection from the Stade de France crowd but also when it came to the standard of rugby they were producing. Robbed of form and favour they had no right to produce such a dazzling display. They oozed confidence when this game was supposed to be all about rebuilding a reputation. But that is French rugby. Unpredictable and enthralling in equal measure. France fly-half Francois Trinh-Duc was absent in the autumn through injury, so was saved the embarrassment of the Wallabies defeat, but was making his first appearance since the two equally demoralising defeats to South Africa and Argentina last summer. He showed no mental scars with a lively display, including an outrageous pass between his legs that perhaps best summed up the care-free attitude of his side. However, the fleet-footed Maxime Medard was the tormentor-in-chief and proved elusive throughout. 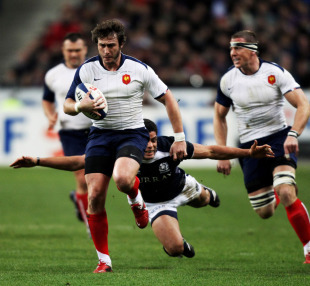 It was his speed that put France on course for victory and that valuable trait was often the driving force behind his side's enviable ability to wreak havoc in broken play with some hypnotic running rugby. The ever-impressive Imanol Harinordoquy, skipper Thierry Dusautoir and centre Aurelien Rougerie also caught the eye but it was France's general support play and desire to right a few wrongs that set the tone for the day. And when aligned with a dominant scrum it made for a compelling argument that suggests Marc Lievremont's side are not the spent force some may have been led to believe. But as magical as they were at time it was not a faultless display from the hosts - far from it. Defensive lapses punctuated their performance, with missed tackles and lazy lines gifting Scotland more than a foothold in the game. As impressive as their running was in broken play that too was built on the generosity of the visitors in terms of turnovers. Those gifts in particular will grate with Scotland boss Andy Robinson. His side battled bravely and went toe-to-toe as he had demanded but were made to pay for their failure to secure the ball. France may well have cut them apart anyway, the mood they were in, but they certainly didn't need a helping hand. There was to be no repeat of the famous Paris triumphs of 1995 and 1999 but this game may well bear fruit in the future as a stepping stone in the development of this side. This Scotland was a world away from the impotent team that has drawn much scorn in recent years and such a performance would have accounted for most if not all of their other Six Nations rivals. The game plan was not dominated by the boot of fly-half Dan Parks, with an all-action approach the order of the day and the result was pleasing on the eye. The Scots had not registered three tries in a game since the 2008 rout of minnows Canada and suddenly they appear to be a multi-dimensional force once again. But let us not get carried away. They were taught a lesson at scrum time by a classy French pack and it took some desperate defence at times to prevent the hosts blowing them away. At the heart of that rearguard action was towering lock Richie Gray whose work rate did much to shackle what was at times a rampant France side. Whether engulfing wing wizards inside his own 22 or galloping into French territory, Gray was almost omnipresent and appears destined for greater things. Skipper Al Kellock was also an inspirational force while Kelly Brown's industry is also of note. In the backs, Joe Ansbro also offered a glimpse of a brighter future. Scotland will be there or thereabouts come the end of March. The Scots had won twice in the French capital in 42 years prior to tonight's match and knew the opening 20 minutes would be crucial but they were not afforded the luxury of time to bed in. It took France only two minutes to re-announce themselves as a world class force with a devastating reminder of how they play this game in Heaven. Scotland had begun the game with confidence but it was immediately apparent that they would require an added magical element to live with France on a day like this. They could not quite muster that precious ingredient but the fact they were not swept away is a credit to the work of the team and Robinson. This performance will reverberate around the globe and the fact there is clearly still room for improvement will not be lost on those eyeing the sport's biggest prize later this year. France have laid down a marker for this year's Six Nations and in doing so delivered a priceless psychological broadside to not only their Championship rivals but also to the southern hemisphere giants who had hoped to dominate the World Cup stage.